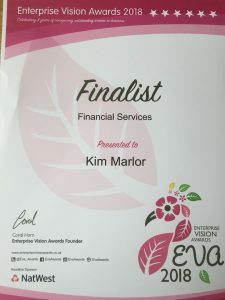 I am proud to announce that we have been voted a finalist in the 2018 Enterprise Vison Awards sponsored by Nat West Bank in the Financial services category. It’s an amazing achievement not just for me but for all the team and is a very powerful testament to all the work we have put in across a number of areas of in terms of improvements to internal systems, customer service, sales and marketing initiatives. Then each judge had 5 minutes to question me on a whole raft of issues from my motivation, to external factors “disrupting” the accountancy industry to future plans for my business. Whilst I was very nervous, it was a very interesting and worthwhile afternoon, (although in truth the whole “interview” only lasted 20 mins). The session was very interesting and allowed me to reflect on me and the business, be challenged and questioned by people who I had never met, so potentially they could have been my target market. It got me thinking how many business owners would benefit from an experience like this as whilst it may take you “outside” of your comfort zone, it’s good to be challenged, stretched and tested from time to time to get you thinking about your business as it is all too easy to be engrossed in the delivery of the day to day and never take a step back to focus on who you are…what you have achieved and how far you have come and celebrate those successes whilst planning for the future. Clearly, I would love to win, but win or loose, it has been a positive experience! So, if you have never entered any awards before, I’d definitely encourage you to give it a go, as clearly the publicity will not do your business any harm, but there’s definitely a bigger prize to entering. The next steps for me are there is a public vote from Monday 20th Aug till Sat 8th September, so please do go onto the website where I’m sure the voting buttons will be. Thanks in advance and keep your fingers crossed for us on Fri 28th September 18 when the actual awards ceremony is held at the Winter Gardens…it’s probably the nearest I will get to dancing on the strictly come dancing set!!! You can view the finalist here and I believe the voting will be from here also! This entry was posted on Thursday, July 12th, 2018 at 10:52 am and is filed under Blog. You can follow any responses to this entry through the RSS 2.0 feed. Both comments and pings are currently closed.